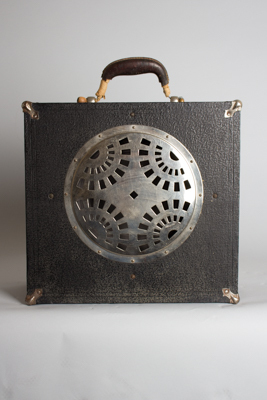 Dobro Tube Amplifier (1935), made in Chicago, black textured fabric finish. The early National and Dobro amplifiers were some of the first competitors made available following Rickenbacker's commercialization of the electric steel guitar in 1933. They are typical of their era, solidly made but fairly plain, distinguished mostly by the use of a stamped resonator coverplate as a speaker cover! The Dobro and National amps are similar, though the early models featured different cover plates over the speakers -- this one is the Dobro version. This is still a quite functional amp, a lovely survivor from the earliest days of electric music. Height is 14 1/2 in. (36.8 cm. ), 15 in. (38.1 cm.) width, and 7 3/4 in. (19.7 cm.) deep. The power cord has been replaced with a modern detachable 3-prong, but otherwise this is a nice and very original amplifier. The tubes are period, the thin outer covering cleaner than most and even the original paper-covered handle is still present, albeit somewhat worn away at the ends with a slightly funky bolt retaining it at one side. This is quite a good-sounding amp for its day, not quite as loud as the early Gibson ES-150, but with more headroom than many other period amps. A wonderful period piece and a nice example of one of the world's first commercially available guitar amplifiers. Excellent Condition.